While the wood from this mountain tree is practically worthless in terms of lumber, it produces an important and interesting essential oil. The aroma is rich, sweet-woody and almost balsamic and makes an excellent soap ingredient and is commonly used in India for that purpose. Warm, rich, and soft fragrance. The botanical name for this particular species of Cedarwood that grows in the Himalayas is "Cedrus deodara" and is derived from the Sanskrit name 'devdar', meaning "timber of the gods". Himalayan cedar (Cedrus deodara) is a type of cedar native to the western Himalayan region where it grows at altitudes of 1500 to 3000 meters. 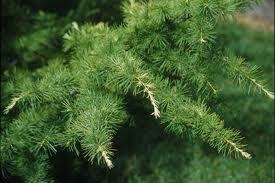 It belongs to the large evergreen coniferous species and can grow up to 50 meters in length. It may have level branches or drooping branches. The leaves are like needles reaching a length of around 5 cm. the color can vary from green to a bluish green color. The tree produces both male and female cones. The tree is highly respected in north India and it is even worshiped there as a sacred tree perhaps because of its medicinal qualities. The tree is widely grown as an ornamental tree, planted in parks and gardens for its unusual drooping foliage. The tree is grown all over Europe and parts of North America for this reason. The wood has been used to make houses because of its natural resistance towards termites. The oil can be either a yellowish or brownish color and is of a medium viscosity. It is also known as the Tibetan Cedarwood and in the Egyptian Culture this oil was used in the production of perfumes, cosmetics and to embalm. The Aromatherapy uses of Himalayan cedar wood are similar to that of other cedar based oils. Its properties include antiseptic, anti-putrescent, aphrodisiac, astringent, diuretic, fungicidal, sedative, and as a stimulant. In south East Asia it has been used as an insecticide and as an antifungal remedy. As an antifungal it has been used on animals also such as cows and horses, where it is applied to their hooves to avoid fungus growth. Himalayan blends very well with chamomile, Citrus, Rosemary and Eucalyptus essential oils. It is considered to be uplifting, toning and warming, reviving and comforting. It is also considered to be inspiring and an aphrodisiac at the same time. It helps to build confidence, it is long lasting and, in perfumery, it acts as a fixative. This essential oil is considered as a non-toxic, non-irritant and non-sensitizing. It should be avoided during pregnancy.